Teacher Tian Tian and her young artists in China have been busy making art! They were experimenting with the carbon transfer technique and then used marker to add color to their self-portraits. Their friends in Finland cannot wait to meet them! 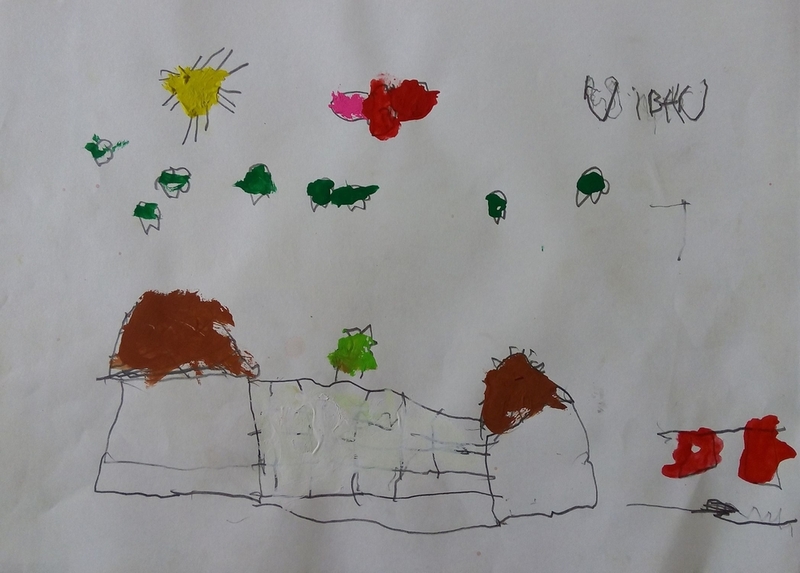 The 6 year old artists at Shenzhen Primary School in Shenzhen, China are making and sharing with the Explorers, 5-6 year olds, from International School of Helsinki in Helsinki, Finland. Come out for a picnic with us! Now we have almost finished the table cloth, the gift to our friends in Texas. The kids are so proud of their work! We had a lot of fun doing the project „Come have a bite to eat with me“, and the kids liked thinking that their friends abroad would go out for a picnic using the table cloth that was made here in Iceland. Ithas lively, happy colours as we would like to feel when we go out together and have a good meal! On Wednesday, we will have a school exhibition where the kids are showing their work to their parents and inhabitants of our town are invited. We really want to have the cloth there for them to introduce this wonderful project to them. After that we will send it to you. The 1st and 2nd graders at Grunnskóli Fjallabyggðar in Siglufjörður, Iceland are making and sharing art with the 2nd graders at Amy Parks Heath Elementary School in Heath, Texas. Здравствуйте! Посылаю фото масок и книг, думаю. Напишу, когда начнем делать след задание. Всего наилучшего! "Hi! Here are photos of the books and the mask. I will message when we start making the next task. All the best!" The artists from Кепа школу (Kepa School) in Karelia, Russia are making and sharing art with the 1A artists at Viertolan Koulu in Vantaa, Finland. From Iceland to Texas, with love! Here are pictures of the work, tomorrow the books will be sent to Texas. The kids have had much fun doing the books. They introduced their book to the class, keeping it a secret which food they had chosen. The class was guessing and they were very excited, and in the end the secret came out. Thank you for giving us the opportunity to take part in this, and it is also great to see it on Facebook. Anything is possible when you're having fun! The mask project was difficult for grade 1 students to understand (we teach art in French), but the projects are cute! Elizabeth Goldsworthy and her 1st graders at Sheppard Public School in Ontario, Canada are making and sharing art with Tatjana Knudsen and her 3rd graders at Korsholm Skole in Hinnerup, Denmark. Walking this way and that way! The headline "I'm a walking pattern" made my 3rd graders wonder how they actually could be walking patterns, but it didn't take long before they started to examine their hands, fingerprints, eyes and skin. As a teacher it was an interesting process. My students were so absorbed in their study that they didn't really need me in the room. Very fast my students discovered that our body really is a walking pattern. One of the students even said: "Tatjana, it is so amazing our body is full of different lines and patterns......each and every one of us is a little miracle". Wauw! Another student asked if they could have magnifying glasses, and of course they could. Within a few minutes I saw 19 young detectives investigating patterns on their hands, fingers, and skin. I asked my students how we could make a piece of art, that could show what we had discovered about our magnificent body. One suggested that they made drawing of their fingerprints, another said that It would be fun if they could make a print of a hand walk. I was into the last idea, and I must say that I think the results are so full of creativity. I'm proud of my 3rd. graders and I hope that our friends in Canada will be pleased with "the walking handprints"
Tatjana Knudsen and her 3rd grade artists from Korsholm Skole in Hinnerup, Denmark are making and sharing art with Elizabeth Goldsworthy's 1st graders at Sheppard Public School in Ontario, Canada. Halla and Guðný, teachers of 1st and 2nd grade artists know how to get everybody excited! What a wonderful idea they had to use microscopes!